Electricians Brighton » Heating Systems » Can an Electrician Install a Thermostat? Yes, an electrician is qualified to install a thermostat. In fact, it is a legal requirement for new thermostats, especially ones that require a continuous supply of power, to be installed by a trained and licensed electrician. 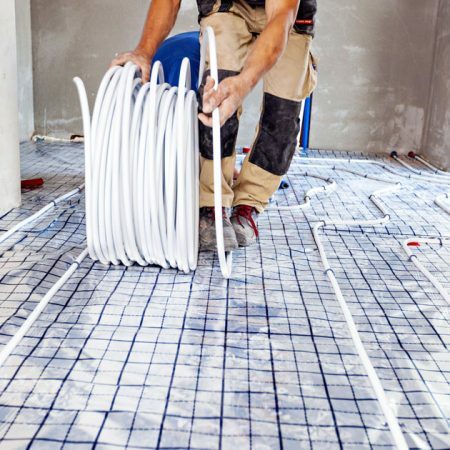 You may consider hiring a plumber or installing it yourself, but, if you don’t have a C-wire, it is important you leave it to a professional. A significant part of installing a thermostat in your home is deciding on the best location for energy efficiency and convenience. Electricians are generally better at deciding where to put your heat link, however. As a general rule, you are not to position it where there are large metal objects, as this will block the thermostat’s signal and lead to poor performance. For instance, your thermostat should be placed at a distance from your boiler or your water tank. An experienced electrician will choose a room where you spend a lot of your time in or a few metres from a power outlet. It is important to work with a professional because electrical installations are risky ventures in general. Often, the guidelines and DIY tutorials available online can only guide you through a hitch-free installation when there are no unexpected hurdles. But, in the real sense of it, you may face challenges which can only be solved by an expert with years of experience. You can set up the connection yourself and choose a language. Those are the easy parts which anyone can do. The installation, on the other hand, should be done by a specialist. Your thermostat must be properly installed to ensure it functions optimally. An electrician, a plumber, or a home energy professional can all install a thermostat. However, you have to determine the competence of whomever you are hiring. Third party certification (a Nest Certified professional, for example) in this area is the qualification you should look out for in the expert you want to contract. In the United States, for example, a DIY installation of thermostats is not uncommon, and you will be done in less than 1 hour with a fully-functional appliance. But, here in the UK and Ireland, the design is a bit more complicated to the point that the assistance of a professional is required. Most UK-designed thermostats come with a trim plate (which is optional), a micro USB cable, a heat link and a plug. Connecting the heat link to your boiler requires the assistance of a qualified professional. Your electrician’s help is also needed in connecting the neutral and live wires to the heat link. A licensed electrician will be able to do your installation in less than 2 hours, and for a low cost. An experienced electrician will have a deep background knowledge of the different types of thermostats available and their features. This makes it easy for them to help you figure out the one that is most suitable for your needs and energy plan. Whether you choose a digital, modern, manual or a simple thermostat, a well-trained electrician ensures that everything is properly installed.